This is going to be a walk through to making your own historical or imagined scenario for the game. The rules came with the ability for the player to make his own scenarios. 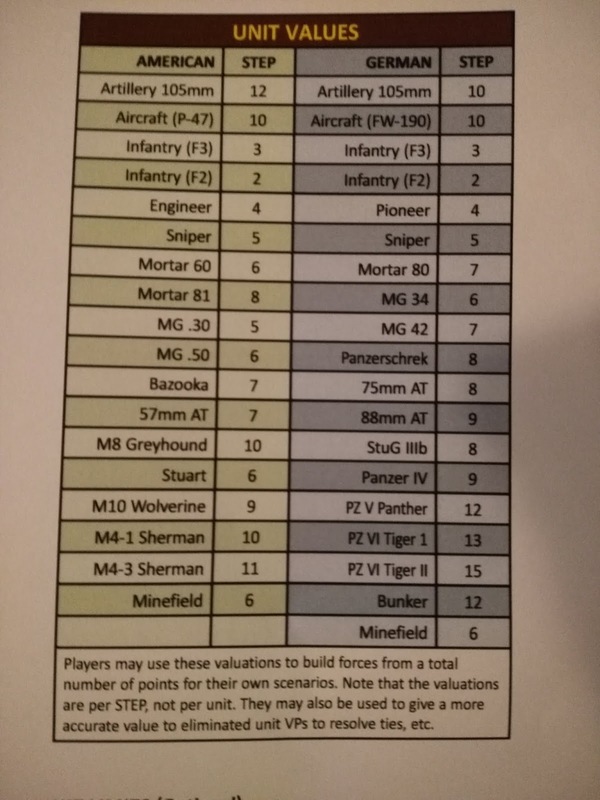 It came with a Unit Value Chart that equates each side's weapons to each other. 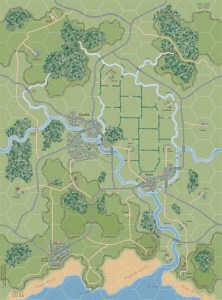 These help the player determine what forces each side will posses for his scenario. I have chosen to have a large American force attack a small thrown together German force during the battle of the Falaise Gap. The German force is desperately trying to stave off the Americans and give other units a chance to retreat. They are pretty much a forlorn hope. The German rearguard does still pack a punch, so the Americans can not afford to be rash. Slow and steady wins the race. The game takes a leap compared to other tactical games because it is missing the following: opportunity fire, suppression, facing, and hard and soft targets. However, the designer's arguments for them being missing are very well thought out. It also makes the game quick playing, but still be deep. 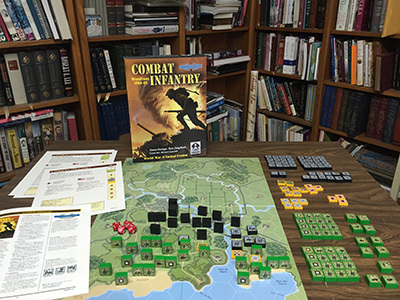 The game has rules about stacking, hex control, river crossings, foxholes, and mines etc. Command in the game is as important as it was in real life. A big thing to remember is that the unit values when choosing your troops are per step and not per unit. The game does have rules regarding weather and night scenarios. The rule book is only 12 pages long. So remembering them is not difficult after a few play through. In my scenario I did not choose to have either side to have any off- map artillery support. The Germans are trying to retreat theirs, and the Americans are pushing forward too quickly. 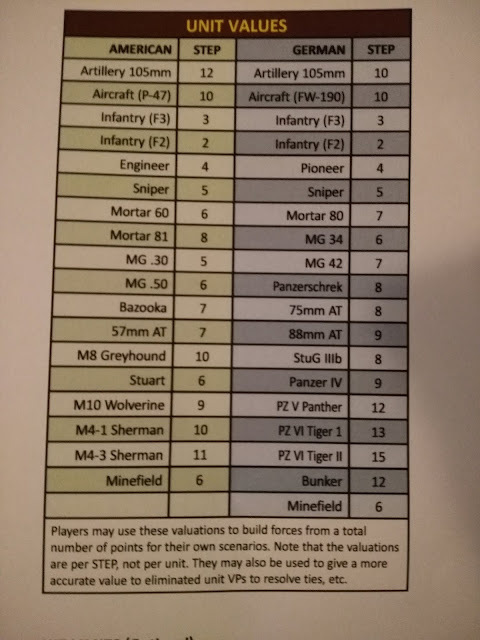 So going back to the Unit Value chart, my German force is going to have a lot of already damaged units. The Americans are also going to have some beat up units due to breakdowns and previous contact. They will, however, have limited air support. The American player should win my scenario nine times out of ten due to the force discrepancy. However, I am going to skew the odds of winning by forcing the American player to get a victory quickly or not at all. 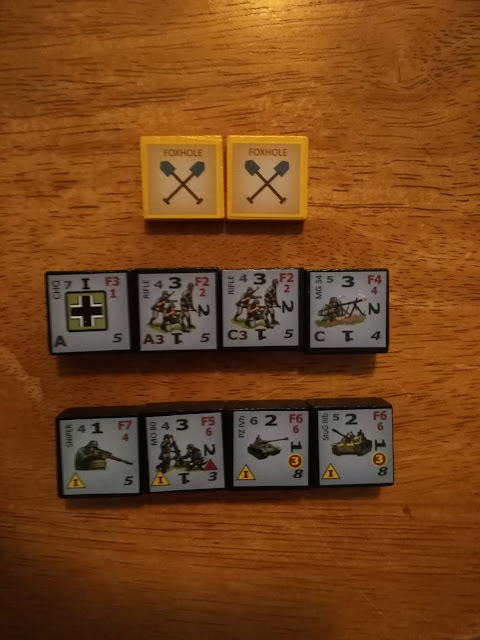 For my scenario I am adjusting the rules so that instead of drawing Battalion assets they are already assigned to each side. I am going to use a six-sided die to randomly pick how many steps each unit has. On a three step unit 1-2 is one step, 3-4 is two steps, and 4-6 is three steps. The Germans in the scenario are only getting one headquarters and that is a Company one. 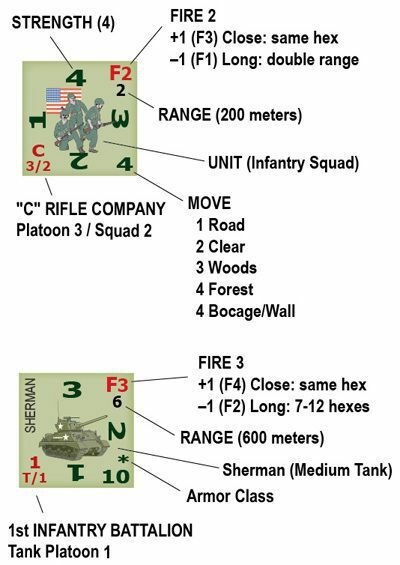 This is to represent the breakdown in their command during the Falaise Gap Operations. The American four step units can only be setup up as one to three steps. This is to represent losses, but also their supply situation. This is just a hypothetical situation, so I did not create it with certain hexes or map areas in mind (except of course not using beach hexes). I would suggest that you give the German player as much of a terrain advantage as possible. I would also play the German side in solitaire. When playing with two people I would give the Americans to the lesser player, if there is one. 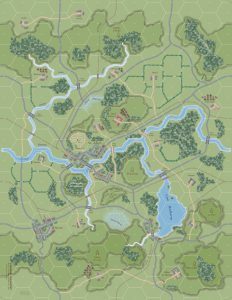 I designed the scenario to have only four turns. This was to help offset the preponderance of troops on the American side. I added the die rolls for steps at the last minute after I played through the scenario a few times (I adjusted each side's steps a few times). 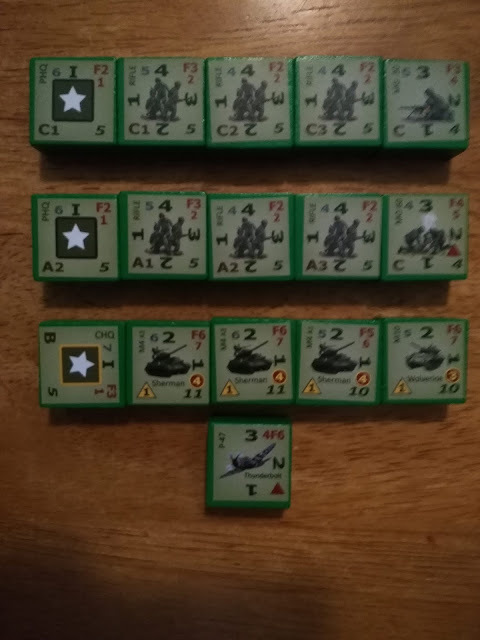 I find that it now adds the chance for the Germans to be much stronger and the Americans to be weaker to add a good amount of fog of war to the scenario. I have played a little fast and loose with a few game rules. However, I have not changed anything in the actual game mechanics. It is too good a game to fiddle with those. As a preamble I am not talking about this game, but games in general. With board games you own them and can play and fiddle to your hearts content. If you find a rule that you feels skews the game or actually hurts game play, change it. The internet is also crawling with tons of house rules for almost any game. Of course, if you are always playing against people, make sure both of you agree to the change. You can sometimes turn a head turning rule into one that makes much more sense. I will step off the soapbox now. 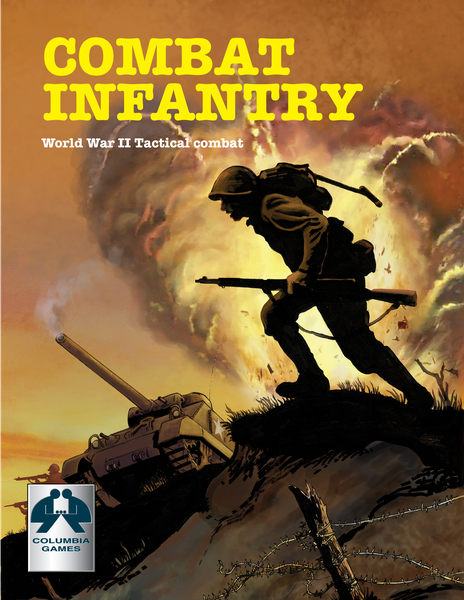 Thank you Columbia Games for the chance to review Combat Infantry, and to do this little walk through. I will be reviewing their games Julius Caesar and Pacific Victory in the near future.